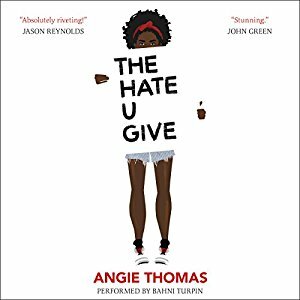 The Hate U Give cover. Photo from Wikimedia. The Hate U Give is a novel about a young teenager, Starr, who witnesses her childhood friend, Khalil, shot after being falsely accused of having a gun in his hand by the police. After having witnessed her friend’s death, Starr enters the world of activism. All the while, Starr is switching worlds between school and home and trying to find who she is. When it is announced that the officer that killed Khalil would not be charged with murder, Starr’s neighborhood becomes a “riot” zone. Khalil was accused of being a drug dealer and a “gang banger” when no one really understood the story of. People seem to have little sympathy for his death because how he was perceived. He sold drugs for King, who is the leader of the gang, King Lords because his mother was in debt since she stole money from King. King made everybody think that he was a King Lord because he put a gray bandana on his casket which implied he was a crucial member of the gang, which he was not. DeVante is a very vital character and I think without him the story can’t be the same. He comes into the story as a “second Khalil.” First, he comes in when Starr and Seven (Starr’s brother) are playing basketball while riots were breaking out on the other side of town. A Garden Disciple (the rival gang of the King Lords) walks up to Starr and Seven with a knife and tries to mug them when DeVante (a King Lord) walks up and shows a gun to the Garden Disciple and tells him to leave which he does. DeVante is not really important then. He later becomes vital to the story when Starr and Maverick (her father) are in the store when it is closed. DeVante bangs on the door claiming he is “hungry,” when in fact, he is really hiding from King because he stole $5,000 from King so he could send his mom and his siblings out of town. Starr goes to a school called Williamson High. This school is primarily white. Starr’s parents made her and Seven go to this school because in Garden Heights there is only one high school which is where you go to get “jumped, high or pregnant”. When she goes to Williamson, she has to change her personality totally from “Hood Starr” to “Classy Starr.” She changes her personality because she doesn’t want anyone to think that she is “ratchet.” No one knows that she was the witness of Khalil’s death and that she even knew who Khalil was. Thug Life is an acronym that is made by Tupac which stands for “The Hate U Give Little Infants F**** Everybody.” Thug Life is also a big part in The Hate U Give. Thug Life means “whatever society throws at us when we are kids will come back and bite them in the**”. Not only did Tupac have a crucial part in this book, but “The Fresh Prince of Bel-Air” also had a huge part because the story in Fresh Prince of Bel-Air is similar to Starr’s life and how she switches personality in the different places she is in. Many in society today think that everything is fine in the United States and many are unaware of the social issues that are very much apparent today. I highly recommend this book for young adults to know what is really going on in the world. I really like The Hate U Give because it tells society to wake up and “smell the coffee”. My favorite character is easily Maverick. He is definitely the strongest influence in the story. I think that without Maverick, Starr wouldn’t stand up for Khalil and become who she really is. I think that people who think that the world is perfect should read this novel. The importance of this novel is to teach you about problems in the world.